The Norwich Film Festival had the privilege of catching up with the 2016 Best Student Short Film winner, Joshua Carver. His brilliant film “Mary No More” which was shot locally received wonderful reviews from our industry judges and we are proud to discuss his film a little further. So firstly……..
NFF: Can you tell our readers a little bit about Mary No More? JC: Mary No More is about a young woman experiencing death in the family for the first time, reconnecting with relatives, and how she reacts to the whole thing – not always in the most appropriate ways. I’m not particularly good at or fond of categorising and explaining my work but culturedarm.com called it “an eloquently composed character study, with fine acting and gentle pacing, a quietly challenging meditation on maturity and the spell of time” which I thought was a pretty amazing review, so I’ll take their word for it. NFF: What inspired the theme of Mary No More? JC: There several different themes and preoccupations explored here but the central theme of death is something that I developed quite reluctantly. I don’t tend to form ideas starting with a theme or subject, I starts with an image, or rather several images that start to link themselves together. That’s when vague ideas start to form into something substantial. The reason I didn’t specifically want to make a film about death is because I thought it would be too ‘dramatic’. I like to make small stories, to focus on details that other filmmakers might ignore in favour of the more obvious drama. But the plot of MNM was just the result how these images that I had fallen for started stitching themselves together. David Lynch describes this process beautifully in Catching The Big Fish: “Desire for an idea is like bait…the beautiful thing is that when you catch one fish that you love, even if it’s a little fish—a fragment of an idea—that fish will draw in other fish, and they’ll hook onto it.” I realised that I shouldn’t resist it and that I can still make a ‘small story’ with a big theme, by subverting the treatment of it, focusing on unexpected things. This is why the death happens off screen, and the Grandmother hardly features at all. Don’t worry if you haven’t seen it yet, that’s not much of a spoiler – the film is really about other things, focussing on Mary’s internal experience. Another reason why I was reluctant to talk about death in the family is that I hadn’t experienced it myself yet at that time. That’s also probably what drew me to it. It came from a place of anxiety, of guessing at how I might feel when it happened. My grandad was ill at the time and died not long after the film was completed, so these things all fed into it. When I first started writing, the character that dies was his/her grandfather, but it was a bit too close to reality for me. I didn’t feel comfortable making the film like that, especially as we ended up actually filming the whole thing in my grandparents’ house. I borrowed a technique from Lars Von Trier and switched the sexes around. The masks of fiction are very useful things. NFF: Tell us about the process behind the whole student project and how long it took to make? JC: This was the final project for my MA in Moving Image and Sound at Norwich University of the Arts (NUA). There wasn’t a specific brief which dictated that I had to make this type of film, or that it had to be 24 minutes long. We had a lot of choice over the direction to take our projects in. In fact they would have preferred if it was much shorter. Frankly I would have preferred it too – it would have been a lot less work. That’s just how long the idea ended up when I wrote it. I didn’t want to force it into a form that it didn’t fit in, particularly when you have something that’s so focussed on one character, the audience needs to spend enough time with the character for it to be effective. I was doing my MA part-time so I had 6 months for my final project – although I ended up working on it more or less full time, particularly in the last few months. This was a deliberate choice, I wanted to put the effort into this film to exceed my previous projects in all departments, which I feel I more or less succeeded at. There are certainly some people who respond more positively to some of my previous efforts, but I don’t agree. My previous projects all have things I liked about them but they were pretty rough around the edges, many of them being unfinished in one way or another. Not just in a technical sense, I also wasn’t happy with my own approach to much of the earlier work, that I was being too obvious about certain things. This is something that I continue to struggle with and there are things I wish I had treated with greater subtlety in this one too, but it’s always such a difficult balance to achieve, compromises always have to be made. For my final MA film I wanted to do the best I could. I had actually planned to come into the unit with an idea already worked out, but it didn’t happen like that. I put a lot of pressure on myself in coming up with an idea that I could fall in love with. So I came into it empty handed, worrying I still wouldn’t be able to think of anything. Luckily, the pressure helps the idea-forming and soon I had three images that I felt could fit together somehow. The first was of a passenger in a car at night, looking out of the windows with the lights passing over her face. This image actually came from a very short script that I wrote in a previous unit but never made. The next was the girl, hanging upside-down from a tree whilst receiving bad news. The last was her, urinating on the toilet, whilst tears start to form in her eyes and she rushes to look at herself in the mirror, but the tears have stopped. I won’t go into specific reasons why I wanted to film these individual moments. Some reasons I know, some are probably unconscious. I will say that the upside-down-in-a-tree idea I liked as a technique more than anything. As I mentioned, I wanted to subvert the drama to a certain extent, so I like to play with ways to express emotion through form, cinematically rather than purely through acting. I then approached the plot more as problem solving than anything else – how to stitch this thing together in a way that I find interesting? To begin with I actually started to take this in a different direction to how it ended up. In Richard Feynman’s autobiographical book Surely You’re Joking, Mr. Feynman! he discusses the death of his wife, and it’s written in a way that is touching in it’s restraint, and appealed to me both thematically and in the imagery it conjures. I thought that an adaptation of this in some form might be the way to bring these different images together, that’s how it became a story about death. But as I laid out the scenes together in my head I realised that there were just too many different themes that this story opened up that I wouldn’t be able to explore properly in a short film. So that part of the film was jettisoned before I got to a proper draft stage, but it had a big effect in initially shaping the story. Mary No More from Joshua Carver on Vimeo. NFF: How important do you feel it is entering your film to film festivals for students? JC: It was particularly important for me to enter this film into festivals because many of my other recent projects hadn’t reached a stage where I felt they were strong enough to compete. In fact I had only attempted to enter a film into festivals once before, unsuccessfully. This time I was more confident in the film but it was still a difficult process, both psychologically and financially. To have a good chance of getting into a few festivals it’s generally recommended to enter into A LOT of them. This soon gets expensive so it wasn’t really possible for me, I had to choose just a few that I thought might be a good fit for the film, and fortunately we did end up getting accepted into a few. The useful thing about NFF was that unlike many others they have a dedicated student category, which not only offers a discount but also makes it easier for student productions to be shown and judged in the context of their peers, rather than having to compete solely with professional productions. 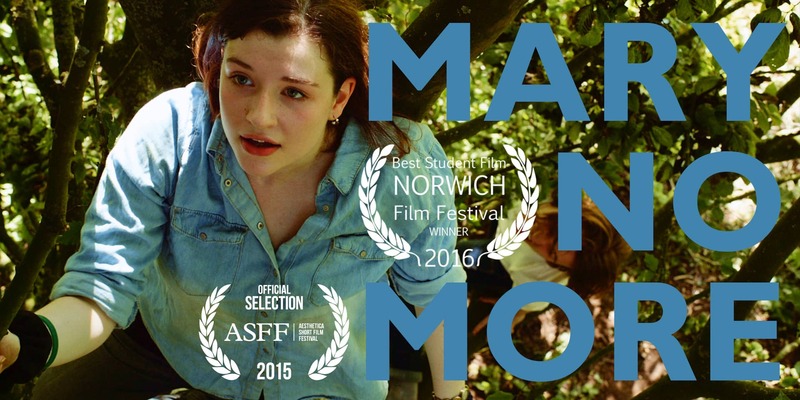 NFF: How did it feel to win the Norwich Film Festival Best Student Film of 2016? Do you feel this will help you in your film career? JC: It was a surprisingly strong student selection that our film was competing in, with work from a range of different countries and film schools, many of which had significantly greater resources than we did. So it was a total surprise and delight to win. I hope it’ll help my career, a festival win is certainly an accolade that gets people’s attention – we will just have to wait and see. I’m hoping to submit again this year, though it’s a project that has taken far longer than it should have already, so I’ll have to work hard to get it finished in time. The new East Anglian category for local filmmakers will hopefully be useful for me, seeing as I’m no longer a student. It’s a shorter short this time, having found it difficult to get into many festivals with a 24 minute film, so this one will be half the length. Again, it’s a small story, called Blood and Stones. It’s about pebbles. And a few other things.